Editor's Note: This is the third in a continuing series of articles on the Japanese art of iaido the modern discipline or way of drawing the sword that assumed its present form in the early 20th century. The series started with “The Study Of Iaido” followed by “Layers Of Shu-Ha-Ri In The Practice Of Iaido.” This article focuses on the curriculum of Muso Shinden ryu iaido, the style of sword drawing that the author teaches. Future articles will discuss other physical and aesthetic concepts of iaido in context of actual practice. Very briefly put, Muso Shinden ryu iaido (MSR) is one of the many styles of drawing the Japanese sword descended from Hayashizaki Jinsuke Shigenobu. As I have pointed out elsewhere on the website, Hayashizaki is considered the "founder" of sword drawing as a form distinct from fighting with swords already drawn. MSR iaido descended by way of Tamiya ryu iaijutsu, along with Muso Jikiden Eishin ryu and many other styles. Some suggest Nakayama Hakudo was the “founder” or “inventor” of the style. From the foregoing we can see this is untrue. Nakayama Hakudo reorganized the Shimamura ha and renamed it in keeping with established tradition. He was the last Muso Shinden ryu headmaster. Since then Nakayama’s senior students have become prominent teachers, resulting in some mild variations in the details of some of the kata. However, my personal observations suggest these variations are very minor. "Muso Shinden" means “transmission [of] divine vision.” However, we should avoid reading too much into its literal translation. The sounds of both "muso" and "shin" are found throughout the history of sword styles, but they are not always represented by the same characters from one school to another. The hearer/reader is supposed to pick up the layers of meaning implicit in the similar sounds, as well as reading the characters. There are also traditional aesthetic and spiritual concepts associated with the characters. For example, the character for “shin” is also “kami,” usually translated into English as “god” but entirely different from any Western concept of the divine. The “divine vision” may refer to Hayashizaki’s vision of the art, or could refer to something else. Therefore, it is difficult to understand this sort of imaginative naming without being familiar with the Japanese language, traditions and some martial arts history. Understanding these less-obvious meanings are closer to understanding the meaning of the name as a whole. Suffice it to say for now that there is more in a name than just its kanji. Muso Shinden ryu has some physical characteristics that are consistent throughout the style. On a practical level, they facilitate learning to handle a sword and perform the various kata (prearranged movements in a pattern used for practice). Among these are the importance of proper grip, cuts and sayabiki. We will deal with these first before getting to some specific characteristics of MSR Omori ryu. In a proper grip, the “meat” of the hands is on top of the tsuka (sword grip). The right hand is always above the left. Single handed techniques in MSR are always done with the right hand. The right hand is approximately 1” from the tsuba (guard). The left hand wraps about the end of the tsuka. The little finger of the left hand is wrapped at the end of the tsuka, not below it. The small and ring fingers of both hands grip more tightly than the rest of the fingers. There should be no “white knuckle” effect. Holding the sword such that the thumb and first fingers form sort of a v-shape on top of the tsuka assures a good grip for the round cuts that are illustrative of the style. As the cut is finished, the iaidoka (a student of iaido) “wrings” his or her hands over the top of the tsuka. This method creates power in, and control, over the cut. Cuts in MSR are done using this “wringing” method mentioned above. They are round in shape, meaning that the tip of the sword always leads the cut. The right hand leads the cut while the left provides support. The last one-quarter of the blade from the tip down is where the cut takes place. We do not cut with the middle of the blade. This method allows the tip of the sword to achieve maximum speed in the cut. It also allows for maximum distance from the target, a consideration in a hypothetical encounter with a similarly-armed opponent. MSR includes throughout a technique called "sayabiki." The sword is seated in the obi such that the tsuba is in the center of the waist. Sayabiki means that as the iaidoka is drawing the sword out of the saya (scabbard) with his right hand, the left hand turns the saya flat and pulls it back and around the waist. To return the sword to the saya, the practitioner begins with the sayaguchi (scabbard mouth) at the front center of his waist, aligns the sword, and pulls the saya back once again with the left hand (the sword stays balanced on the left hand the entire time). Eventually, enough room is created to allow the tip of the sword to drop into the sayaguchi. The iaidoka presses the saya slightly in toward the waist to allow the tip to drop in properly and allows the sword to slowly move into the saya. While this technique underlines some aesthetic concepts that relate to Muso Shinden ryu which will be dealt with in another essay, on a practical level, sayabiki allows the iaidoka to handle a very long katana (sword). An old film of Nakayama Hakudo shows him easily handling a katana that is very long in relation to his overall height using this method. At New York Budokai, we tend to ignore recommendations of sword length offered in catalogs and tell new members to simply get an iaito (iaido practice sword) that is as long as possible without being too heavy for them. Interestingly, sayabiki is also preserved in the much older style of Tamiya ryu iaijutsu (which dates from the late 16th century). We do not know whether sayabiki existed in the Shimomura ha; but we can say Hakudo did not "invent" sayabiki as a characteristic of MSR. The technique already existed. MSR iaido, like many other styles, is divided into shoden, chuden and okuden groups of kata to facilitate learning. It is the shoden level of Omori ryu which interests us here. All of the Omori ryu kata save one begin from the kneeling position of seiza. Seiza is a formal kneeling posture, in which the iaidoka sits on the floor with the tops of the feet flat behind him. The buttocks touch the heels. Critics of iaido are fond of pointing out that drawing a long sword from seiza is a pretty unlikely in actual combat. Most likely, if one were sitting in this way, he would be indoors and hence not likely to be in possession of a katana, or long sword (probably only a wakizashi , a short sword or tanto, a knife). Taylor and Ohmi writing in the Journal of Asian Martial Arts on the history of the style (1) wisely point out that seiza is a useful posture for training the quadriceps and lower back. Moving from seiza allows the beginning student's muscles to strengthen and gain control, essential work for learning how to move with a long sword (1997, 86). As I have mentioned elsewhere, seiza is not only a training tool, it is a formal posture. A beginning student learning a traditional art form, such as sado (tea ceremony), kado (flower arranging), or many other traditional arts, would also be trained in the posture as a matter of course. Learning manners is part of what the shoden forms teach. One of the differences in the seiza used for the shoden forms, however, is that the iaidoka does not "rest" her weight on her heels. By keeping her quads slightly activated, she can rise from that position more easily and gracefully than she could otherwise. Keeping the quads active also improves posture and strength generally. As to posture, for the most part in all of Muso Shinden Ryu, with only rare exception, the back must be kept straight, with the iaidoka leaning neither forward nor backward. Weight is centered at all times throughout the execution of the forms. It takes approximately six months for a beginner to learn to sit in seiza properly and begin to move with control from that position. For some persons it may take longer. As a teacher, I get tired of hearing new students say they "can't" take up this posture; in that case, they "can't" do iaido either. Practicing seiza during a commercial break once a day watching TV is often all it takes to stretch everything to accommodate the posture, given some time. The noto (resheathing the sword) for all the kata in Omori ryu starts from the habaki, the copper or brass end piece at the end of the blade closest to the tsuba (sword guard). 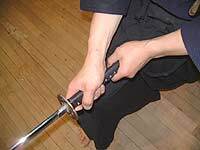 This requires the student to use the full method of sayabiki in order to replace the sword in the saya. Doing the full technique allows the teacher to acquaint the new student with the proper method from the very beginning, and is very good training. We will discuss the individual forms in depth in subsequent essays. The author wishes to thank members of New York Budokai for their assistance in the preparation of this article. Photos of New York Budokai members by Danton Mayorga and Stanley Chin, Copyright 2002 New York Budokai. Calligraphy by Deborah Klens-Bigman, Ph.D.
(1) (Taylor and Ohmi 1997, 82-84). For more detailed information on the history of Omori ryu see Taylor, Kimberley and Ohmi Goyo 1997: “The Omori ryu: a history and explanation” Journal of Asian Martial Arts Vol. 6 No. 1 pp 80-103.